Mrs Sizakele Silungile Ngcobo, MUT’s main Student Residence official, endeared the whole audience made of parents, students, high school learners, guests, executive management, staff and lecturers when she walked up the stairs to receive her Diploma in Office Technology. She is 64 years old and very proud that she has achieved; a dream of setting an example for her children and grandchildren. She has travelled her own journey having to raise five children by herself after the passing away of her husband in the early 90’s. She has done an exceptional job as a single mother with two of her children also having graduated at MUT. Her elder daughter, Amanda, obtained a diploma in Electrical Engineering and her son, Phila, graduated with a diploma in Mechanical Engineering. Both have secured good employment and this has given Ngcobo the relief to focus on her studies. “I initially registered at MUT in 1997, but had to put my studies on hold because at the time my children were still in primary school. I had to see my children through school and university. Once that was achieved I would then have time and funds to finish my studies, age was never an issue. 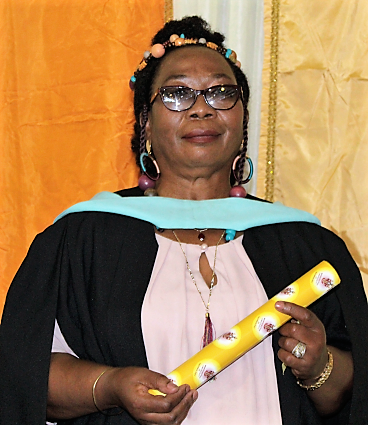 My classmates some of whom are the same age as my children and grandchildren were very good to me, they understood my pace as a mature student and were always there to remind me of outstanding assignments,” said Sizakele. At her graduation on Wednesday, 11 April 2019, the stage had earlier been set by Prof Ramogale, acting Vice-Chancellor with his announcement that she is an exceptional graduand. When she got on stage, the house came down. The confidence she showed, made everyone realise that the qualification was never by accident. It was intentional and will be used fruitfully. She is an inspiration to all. “The University is very happy about this achievement, thank you Sizakele for reminding us that education knows no age and that those who study remain young,” Prof Ramogale said.